New release from Sonido 13! This CD is a limited import. 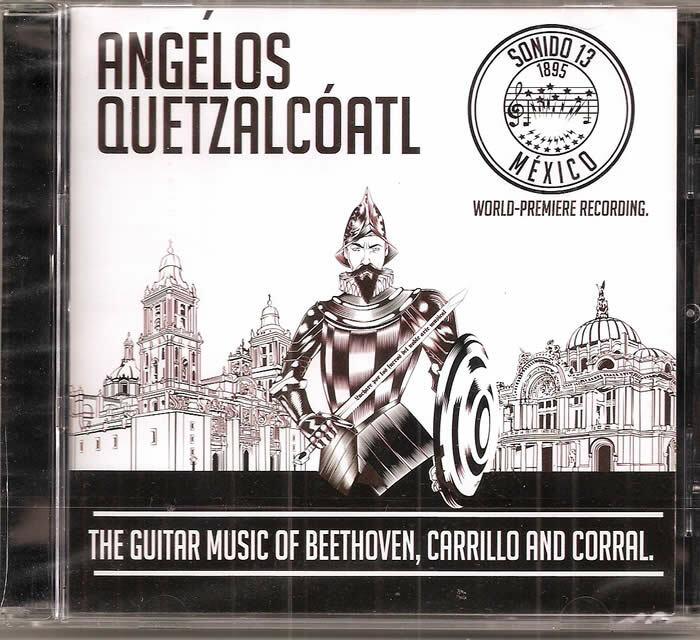 From Sonido 13, Angelos Quetzalcoatl’s new cd, The Guitar Music of Beethoven, Carrillo and Corral, features classical guitar performances that include some rare works by microtonal composer Julian Carrillo (1875-1965). Hailing from Mexico, Carrillo produced a number of instruments designed to play increasingly smaller divisions of the semitone. Included here are Carrillo’s Suite for Quarter-Tone Guitar, Three Preludes in Semitones, Two Preludes for Carrillo Guitar, and Two Etudes in Quarter-Tones. Also included is a piece for Double-Neck E-Guitar by Corral (1980-) and Ludwig Van Beethoven’s Sonata For Guitar.